How Tight Should the Lever Cap Be? 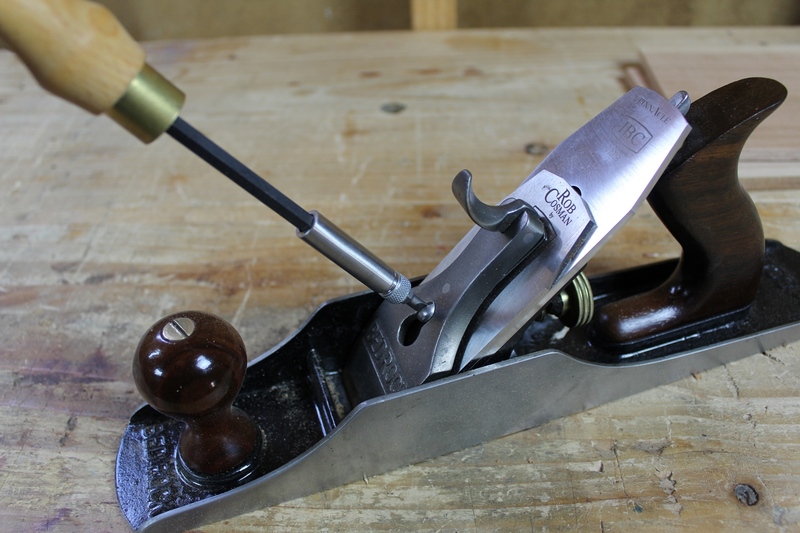 A couple of weeks ago, I did a free seminar on sharpening and tuning up hand planes at the Chestnut Creek School of the Arts. Two of the questions that the attendees had pertained to making adjustments to the plane that I had not thought to include in the presentation. The first was how tight to make the lever cap screw. The second was how to adjust the position of the frog without a lot of trial and error. I’m going to talk about the lever cap setup today. I’ll discuss positioning of the frog in a future post. The lever cap’s job is to hold the iron and chipbreaker securely to the frog, and put pressure close to the cutting edge where it is most critical. In order to apply pressure at the cutting edge, the screw that passes through the center of the lever cap creates a pivot point so that when the lever cap’s lever is locked down, it raises the rear of the lever cap, and therefore presses down at the front of the lever cap. When the lever cap is properly set, the blade should not move rearward or laterally during normal planing, but should be able to be adjusted for depth of cut or lateral position without having to loosen the lever cap. The lever cap screw needs to be tight enough that the blade is held securely in place when the lever is locked down, but not so tight that it prevents purposeful adjustment. My method for adjusting the tightness of the lever cap is pretty simple and reliable. I first remove the lever cap and loosen the screw so that things are too loose. Then, with the iron and chipbreaker installed but retracted, I place the lever cap into the plane but leave the lever in the open position. I use a screwdriver to tighten the lever cap screw until it just barely makes contact with the lever cap. Do not snug the screw at all. If you’ve tightened the screw correctly, it should barely be in contact with the top of the lever cap, but you should still be able to remove the lever cap without any resistance. If there is any friction between the lever cap and screw when you try to remove the lever cap, then the screw is too tight. Back it off until the lever cap is easily removed and reinstalled but the screw still makes contact with the top of the lever cap. The lever cap may slide rearward very slightly when you lower the lever if your lever cap has a keyhole shaped hole, but this is fine. It won’t move in use. 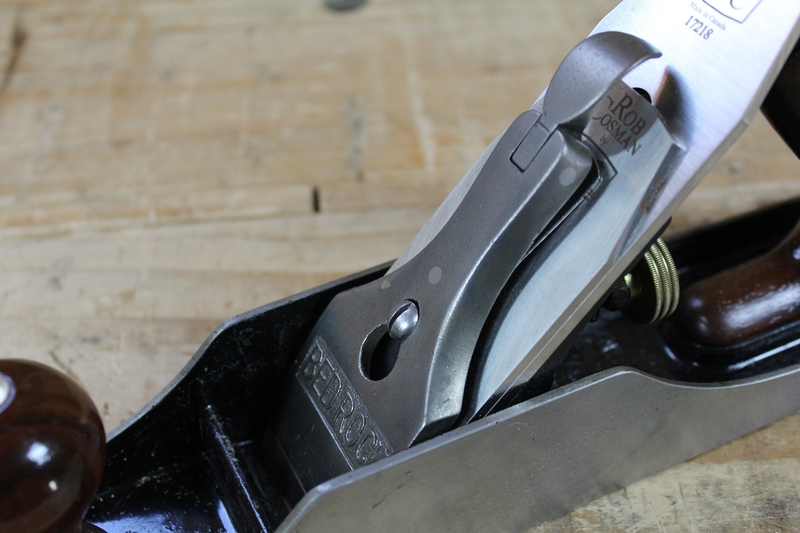 With the lever cap under proper tension, you should now be able to adjust the iron’s depth of cut and lateral position, and once adjusted, the plane should hold that setting. If your lever cap has a keyhole shaped hole for the screw, you might notice a small gap at the top that opens up when you lower the lever. This happens because the lever cap slides slightly rearward when being locked down. Don’t worry if this happens, it’s normal, and with the tension properly adjusted, it won’t move in use. If you’re lever cap has a kidney shaped hole, you won’t have this happen. If you want to see an example of this adjustment being made, here’s a video I did on the same subject back in 2009. Posted in Hand Planes, Tools and tagged lever cap tension, videos. Question for you: Like to hear your thoughts on the IBC blades. Why you chose that blade combo? Your thoughts on the thickness of that blade vs. say the Hock blades or the thinner originals? And, since the blade is so thick, do you use a micro bevel or not? I like the thickness of the iron as it is somewhat reminiscent of the thick blades in wooden planes that I like so much. The thick iron makes honing freehand much easier than with a thin iron because the blade is easier to register on the stone. If you hollow grind (like I do), then honing a thick iron isn’t a big deal as you are always working a small secondary bevel. You can do so with a honing guide too. The downside to the set is that you have to file the mouth of the plane wider, but that doesn’t bother me. If it’s something that bothers you, they make thinner versions as well that can be used with the stock chipbreaker. But then there are other options that I think would be a better choice if you were going to go with an iron that was closer to stock thickness. I’ll write more about it in the future. I want to do a bit of experimenting and side by side comparison of some different blades. I know this has been done before, but I’m not sure it’s been done recently with all of the new steels that have come out. I have to get my hands on some other blades first. I only have two currently that will fit this plane (the IBC and a LN, and they’re both A2 steel). It’s a bit embarrassing to admit it now, but when I was first starting out with hand tools (only about 2 or 3 years ago), I didn’t even realize that you were supposed to be able to adjust the blade depth without loosening the lever cap. I figured that if the blade could be adjusted while the lever cap was secured, it would also slip while planing. So for the first few days (or weeks?) I tightened it way too tight, and released the lever cap every time I wanted to adjust the depth. There are lots of these little things that are kind of taken for granted by experienced woodworkers but are a pretty opaque when first starting out. Indeed! We sometimes forget that not all of these little tibits are common knowledge. And many books on the subject tend to gloss over these small details as well.